Celiac disease, also known as gluten intolerance or celiac sprue, is an autoimmune disease caused by sensitivity to the protein that is found in various grains. At first, a diagnosis of celiac disease may seem like you don’t have many options but the truth is there are thousands of products available that are gluten free it just takes a bit of research. Before discussing celiac disease symptoms, it is important to know the definition of celiac disease. Celiac disease is the damage to the small intestine due to non-tolerance of protein found in wheat, rye, gluten or barley content in foods you consume. This problem actually makes it difficult for the body to absorb nutrients like iron, calcium, fat and other necessary elements. The primary cause of this condition is gluten intolerance by the body. Gliadin and prolamins react on exposure to make the enzyme tissues for modifying the proteins. The immune system of body attacks the small intestinal tissue, and this causes an inflammatory reaction which leads to shortening of villi lining in the walls of the small intestine. This process causes interference with the absorption of nutrients by the body through villi present in intestine. The ultimate cure of celiac disease lies in the lifelong consumption of gluten free diet. Celiac disease symptoms are not only limited to problems like chronic diarrhea, but there can also be other problems like malnutrition, missed menstrual periods, miscarriage problems or infertility, swelling in feet and ankles, discoloration of teeth, sores in mouth, bone or joint pains and above all, the changes in behavior of the affected individual. This problem in the small intestines can, in a worst case scenario, cause various other issues related to weakening of your body system. If you have experienced any of these celiac disease symptoms, and you suspect that you are indeed suffering from it, please get confirmation from your doctor. You need to gather information about the natural precautions and natural remedies, which you can adopt to rid yourself of the symptoms of this disease. It is rightly said that ‘Prevention is better than cure’ – same is the case with celiac disease. The patients need to consume a balanced diet, including fruits, vegetables and different whole grain foods. Any food with gluten content should be avoided, and the products containing them (like bread, cakes, corn flour, cookies etc.) should not be consumed. 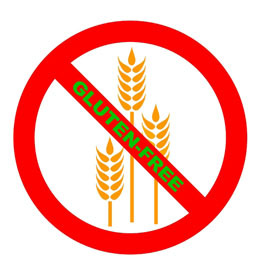 One of the best rules of thumb for suffers of gluten intolerance is to eliminate processed foods from their diet. It is best to adopt a diet of whole foods and plenty of fruits and vegetables. The diet for a celiac disease patient should be planned carefully. Natural remedies for celiac disease are among some of the robust formulas for getting the condition under control. Basically, following gluten free diet in your system can save you from suffering from the worst effects of celiac disease. As soon as any celiac disease symptoms are detected, all possible efforts should be made to take proper precautions for the disease, and to avoid worsening of the condition. Additionally, consult with your physician immediately to confirm the diagnosis, and determine the severity of your condition. A big thank you goes out to The Gluten Free Chef for providing us with a wonderful list of gluten free foods. If you are looking for additional information on Gluten free cooking as well as living with celiac disease I highly recommend you visit the-gluten-free-chef.com.